It might sound like news, but the Arab world is already designing and manufacturing robots that have already entered the market. 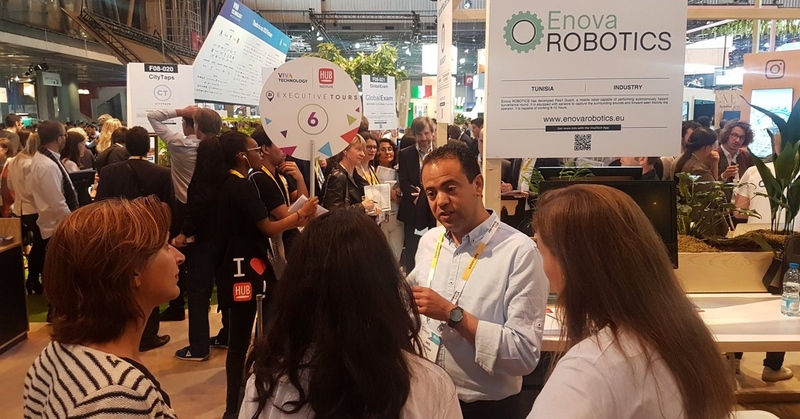 Enova Robotics, one of Arab Startup Cometition’s alumni, is a Tunisia-based startup that has been developing robots in the fields of security, education, healthcare, and marketing since 2014. The startup adopts a holistic approach to robot development, where the founders bring in their expertise in software, hardware, academia, and the regional market to create products that will (soon) become a necessity to an increasingly tech-enabled Arab user. Enova Robotics was founded by Anis Sahbani, a professor of robotics and motion planning at the Sorbonne University after he saw the opportunity in enabling regular individuals to program and build their own robots. 1) Given that you're working on Robotics in MENA, how do you build a successful and sustainable customer base? It was not easy initially to convince customers that there is a company in the MENA region that manufactures its own robot brand. These customers we met them mainly in dedicated exhibitions. Then, it's sort of a blue ribbon selection process, which eventually recommends our company. Finally, the quality and specificities of our products have largely contributed to the loyalty of our customers. 2) What is the potential total market size (in MENA) for your product today? What is its growth rate? Our target is not only MENA region. The global market size is estimated to be at about 2.5 billion USD with an annual growth rate of 10% per year. 3) How did your participation in the Arab Startup Competition accelerate your growth on both, professional (the startup and you as a CEO) and personal level? Our participation in MIT Arab Competition allowed us to refine our business model and especially to see how other entrepreneurs placed themselves on the market. The pitch in front of investors also allowed us to sharpen our argumentation. The best days in Enova Robotics are when the schedule is respected and when the robots are delivered on time. The worst days are when there are problems delivering on time, that's when an exponential stress begins to set in. Nevertheless, most of our days are "best days". 5) What do you do when you're not working on developing Enova Robotics? For the past four years, I have been only working on developing Enova Robotics. During this period, I had only one week of vacation for a physical rest. Otherwise, I read a lot before sleeping. 6) Are you more of a hunter or a gatherer? Hunters are designed to stay focused for a long time on a single task and to do it well, gatherers are capable of multitasking but they don't go deep into their tasks. I prefer to be the planner, the hunter and the gatherer do what I tell them to do and follow my plan. From another point of view, I hunt down history to learn from the mistakes of others and gather new ideas. 7) As an entrepreneur (your own boss), do you have any advice for your previous boss? I recommend that they stay as they are. 8) Which organization within your field, do you aspire to (look forward to becoming at their level), and why? There is no real model to follow in the field of robotics. Nevertheless there are two successes stories. Although I do not agree with everything that has been presented in this article, iRobot company remains a good example to follow. They managed to create a new need, upon which they have also sold thousands or even millions of robots. 9) On the leadership level, how would you convince a team member to do something they don't particularly want to do? Authority does not come by imposing ideas but by allowing time to act. Collaborators, by observing your decisions over time, will have more their self-esteem and respect in the decisions made by their leader. 10) If you haven't started Enova Robotics, what was your backup plan (if you had any)? Before Enova Robotics, I was a Professor at Sorbonne University. I think I'll would still be a university professor if I haven't founded Enova Robotics. 11) What is your take on 'robots will soon take all our jobs'? I think this is a misconception. This thought was also present in the 70s with the industrial revolution and the entry of robots into factories. I think robots are a vector of human progress. The old industry was essentially worker-based, today it is based on engineers. We even talk about real added value. I have learned several lessons recently. Perhaps, the most important would be that in a startup, we do not speak about success (in the true sense of the term) but level surpasses. In a word, stay humble. I continue to teach at universities. My classes are on robotics and in particular motion planning.